I am both privileged and joyful to offer Yoga, Just for You! We are excited about our beautiful new location. Set high up on the hill behind East Gosford you can now enjoy yoga amongst the trees listening to the bellbirds! Contact Jacqueline for class times or book an individual class. 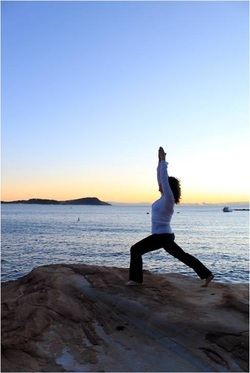 What can be achieved in just one hour of Personalized Yoga Exercise Therapy? What can be achieved with an ongoing regular class? Class numbers are limited to 5 so that you will never be lost in the crowd. Jacqueline listens to your health concerns areas of stiffness or discomfort and develops a program for you within the group structure. Each pose is individually adapted to help you find the right position for balance and releasing tension. With guidance you will learn to understand how your posture and even mental attitude can contribute to discomfort in your body. LISTEN to your body - accept it here and now! Book to join a class with Jacqueline Hilton now! Numbers are limited to 5 participants per class so make a booking now.